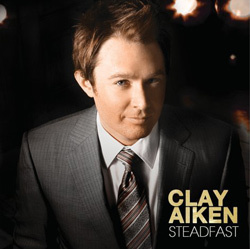 TheaterMania recently spoke to American Idol runner-up and Broadway veteran Clay Aiken about his appearance on "The Celebrity Apprentice" and his new album, "Steadfast," now available through Decca Records. Clay Aiken was first introduced to most of the world when he appeared on FOX's American Idol in 2003, becoming that season's runner-up and, soon after, a top-selling recording artist. Since then, he's starred in the Broadway hit, "Monty Python's Spamalot," has released numerous hit CDs, and is currently a contestant on NBC's reality series, "The Celebrity Apprentice." In addition, Decca has just released his latest CD, "Steadfast." TheaterMania recently asked Aiken if his experience on "The Celebrity Apprentice" had been what he imagined. "I expected it to be grueling, exhausting, tiring -- and it was all those things. In fact, it was five times worse than Idol when it comes to mental stress and worry. You are constantly doing things you don't know how to do and the judges are comparing everyone on the same task. Idol wasn't like that. Plus, I don't like pointing out people's flaws or worrying about who you can trust - that wasn't part of Idol either. And there were cameras on us all the time, unlike Idol. In watching some of the episodes, I've been hearing myself say things I don't remember saying! I think the microphones even picked up our whispering. It's all been very Lord of the Flies." For more interviews, up-to-the-minute theater news, show listings, video, features, reviews of Broadway Shows, and tickets visit http://www.TheaterMania.com. TheaterMania.com is the information and ticketing source for over 5,000 shows nationwide. For over ten years, TheaterMania.com has connected the theater community to the public as the leading online resource for consumers to find shows, get tickets, and save money to theater nationwide. TheaterMania.com publishes comprehensive show listings, provides Broadway ticket discounts, editorial content, and video coverage for over 40 markets and widely distributes free email newsletters and special offers to over 675,000 registered subscribers. In addition, TheaterMania.com creates online marketing programs for performing arts organizations, and provides technology to power ticketing, fundraising, and CRM through its proprietary software, OvationTix.